The Italian Serie A (‘ISA’) kicks-off on 19th Aug. 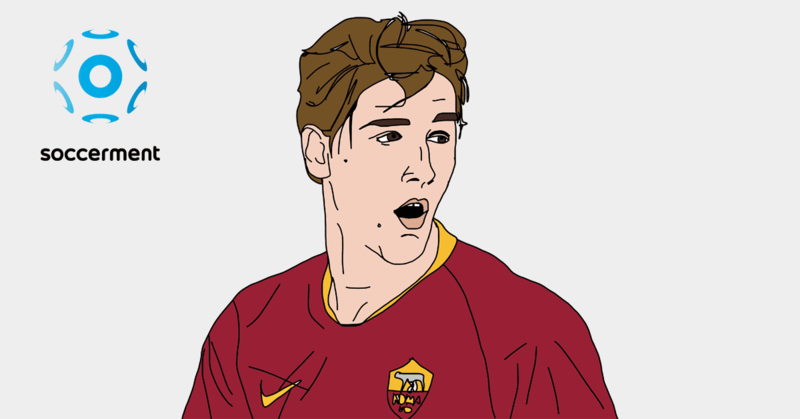 In this post, we try to gauge this year’s possible Capocannoniere, a title which last season went to AS Roma’s Edin Džeko. 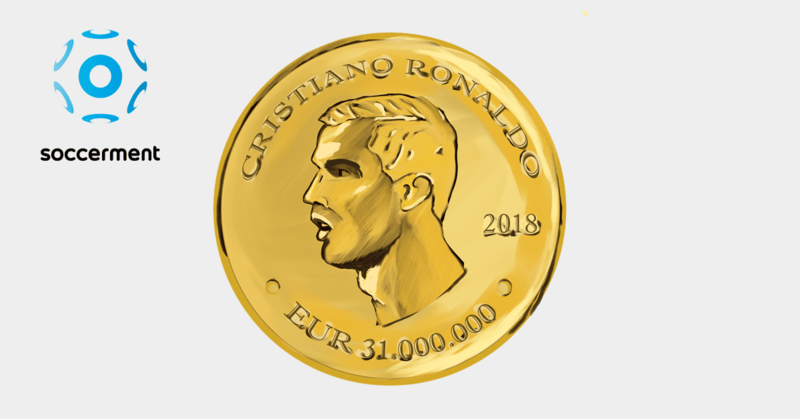 Theoretically, an easy exercise: you just have to assess a team’s potential goals and the possible share belonging to that team’s top-scorer. The reality is obviously more complex, as the performance of teams and of players could vary a lot from one season to another. Take the example of the aforementioned Džeko: in 2016/17 he scored 29 goals in 37 matches, i.e. 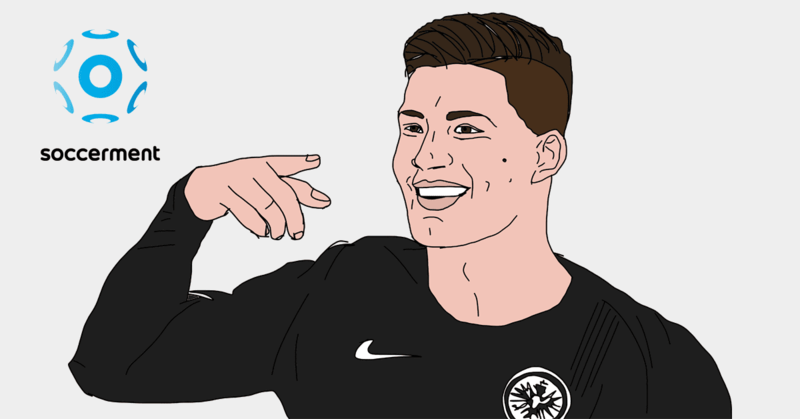 36.5% of Roma’s total goals (89), adjusting for the minutes played; the previous season, he scored just 8 times in 31 matches (18.8% of Roma’s), seemingly a completely different player. Digging into his performance details, we found that what changed, from one season to the other, was mainly the quantity of shots from the six-yard area, moving from slightly less than 0.3 times per 90 minutes in 2015/16 to 0.6 one year later, +113% y/y. What was the main reason? We believe it was mainly due to Spalletti’s tactical approach and the support offered by Perotti and, especially, by Mohammed Salah (11 assists in ISA last year). 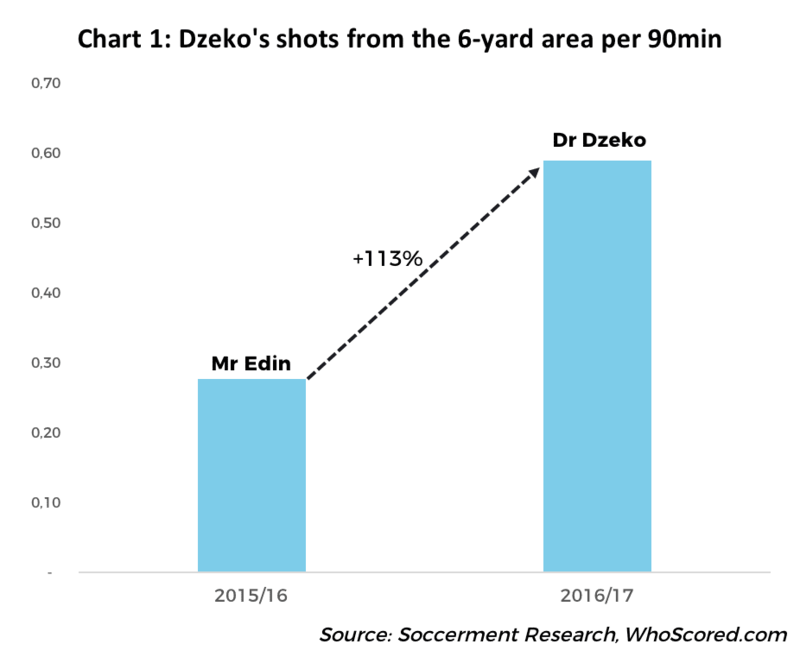 Will the absence of Salah make Dr Dzeko turn into Mr Edin again? It might depend on Salah’s replacement. 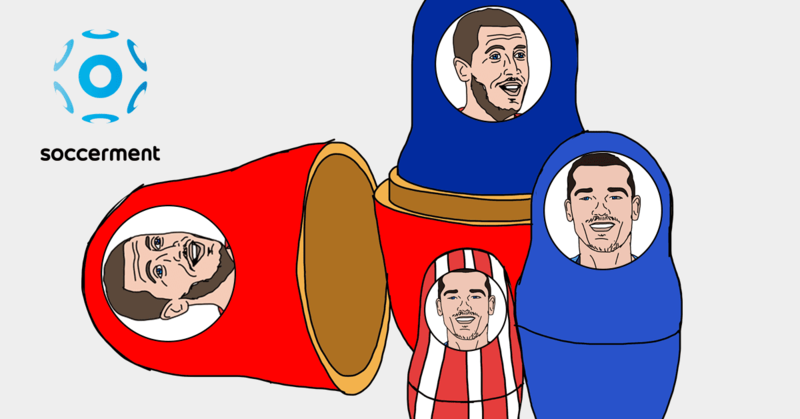 Beside Džeko’s transformation, last year’s biggest surprise was probably represented by the scoring rate of Napoli’s Dries Mertens. 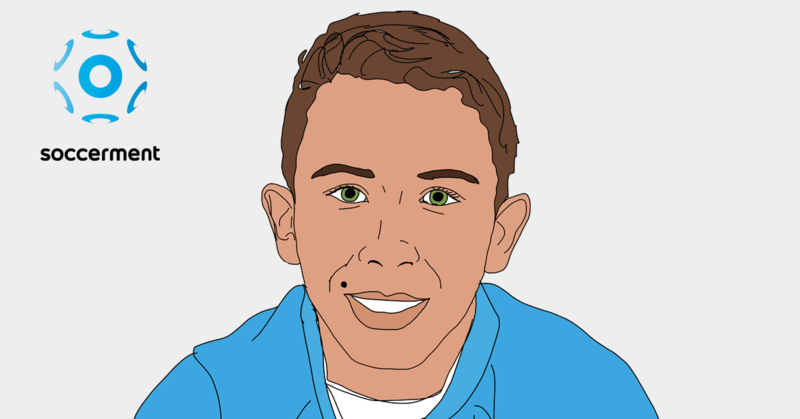 Mertens, quite randomly, discovered at 29 to have the potential to be a centre-forward and, actually, a very good one: he was able to net 28 goals in ISA and 5 in UCL (Uefa Champions League), proving to be more than a good replacement for the injured Milik. 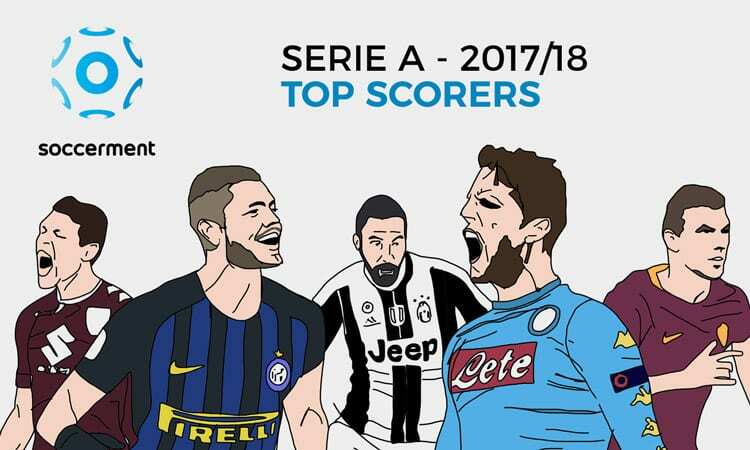 Among Mertens’ 2016/17 performance stats, the most impressive is probably the one related to the number of shots-on-target every 90 minutes: 2.3 vs. 1.6 average for our basket of 30 top European goalscorers. 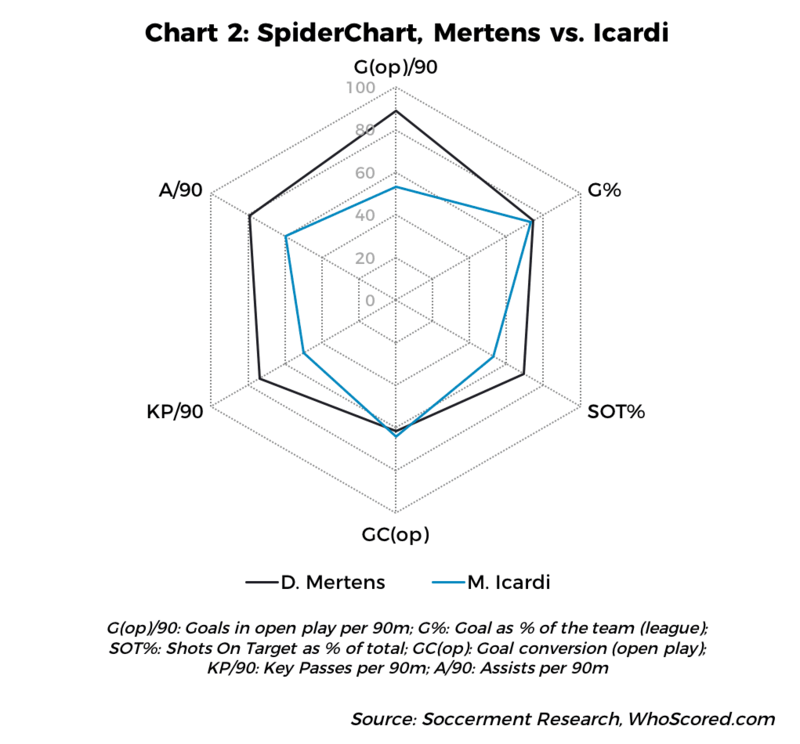 Chart 2 shows Mertens’ outstanding performance last year, even when compared with a “real number 9”, like Inter Milan’s Mauro Icardi: he did not only surpass Icardi on those Key Performance Indicators (‘KPIs’) which are more typical to a “false 9”, such as the number of assists or key passes, but also in terms of goals in open play and of shots-on-target percentage. About Mertens, this season the real question is whether he will have the opportunity to play with the same continuity he had last year, as Milik is back from injury and coach Sarri could consider doing more team-turnover than he did last year, especially if Napoli progresses in UCL. Regarding Icardi, we believe that this season he might have the opportunity to exploit the tactical ability of Inter’s new coach Spalletti and potentially enjoy the same number of shooting chances that Džeko had in 2016/17: in ISA, Džeko shot 4.2 times every 90 minutes (open play), against Icardi’s 2.3. 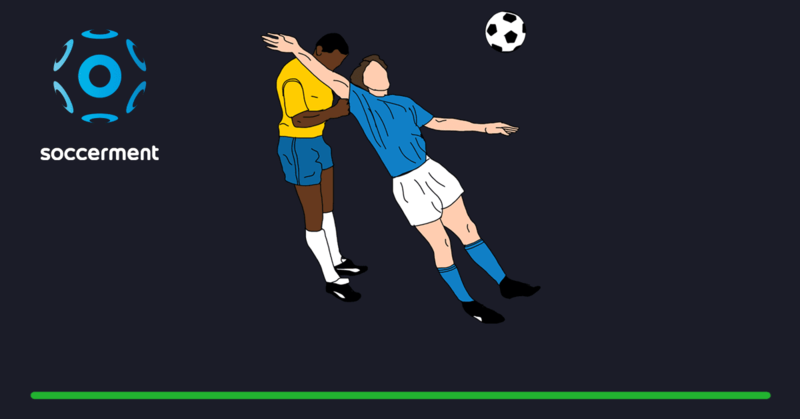 As a theoretical exercise, we calculate that, if Icardi were to shoot that much, based on his goal-conversion rate (19.2% in open play) his total number of goals could end up >30, assuming he played at least 32 matches. The similarities of Juventus’ Gonzalo Higuain and Torino’s Andrea Belotti basically end up with their shirt number (9). Apart from that, as shown in Chart 3, their performances last year differed quite substantially, on many KPIs. For instance, their support to the respective teammates: in ISA, Belotti served 7 assists while Higuain stopped at 3. Belotti’s higher propensity to serve his teammates is underpinned by his number of key passes every 90 min: 1.61 vs. Higuain’s 1.06. The flipside of the coin is that Higuain shot way more than Belotti: 3.4 vs. 2.9 every 90 min, in open play. Furthermore, last year Higuain had a percentage of shots-on-target of 46.0% (the highest in our Italian panel) and a goal-conversion rate of 17.2% in open play, a real sniper. 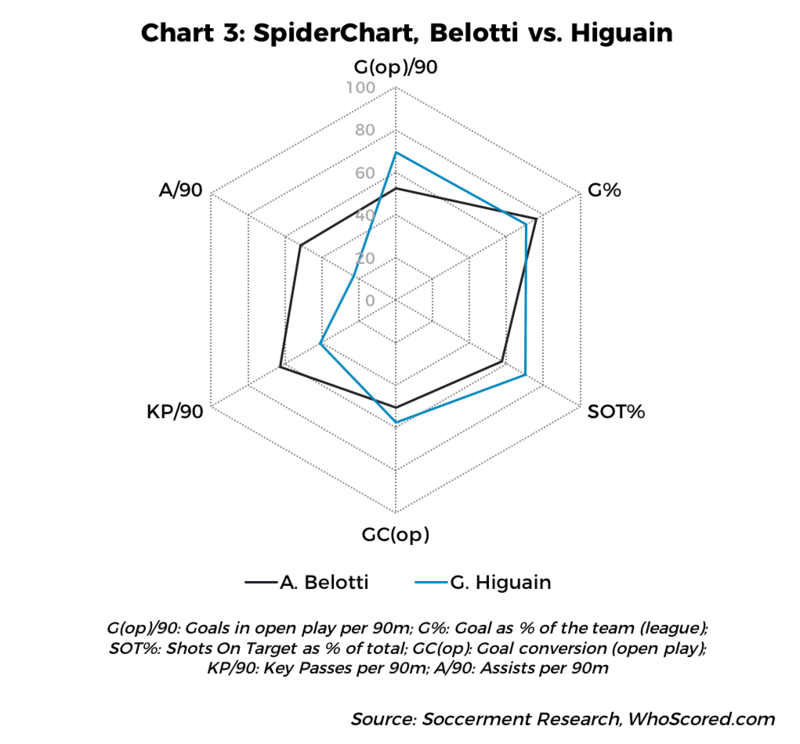 As a comparison, Belotti had a GC(op) of 15.2%. Nevertheless, Belotti made up for this by having a high conversion rate in set pieces, heading with very high precision the balls coming from corners and free-kicks. His headers had an extraordinary conversion rate of 31.3%, in our panel second only to ManUtd’s Lukaku (33,3%). Out of Belotti‘s 26 goals in ISA last year, 10 were scored through headers (42% of total, excluding penalties). It is also worth highlighting that, in our panel of ISA strikers, Belotti recorded the second-highest number of won aerial contests per match (2.4 every 90 min), second only to Dzeko (4.1), who is 12cm taller (Belotti is 1.81m tall). 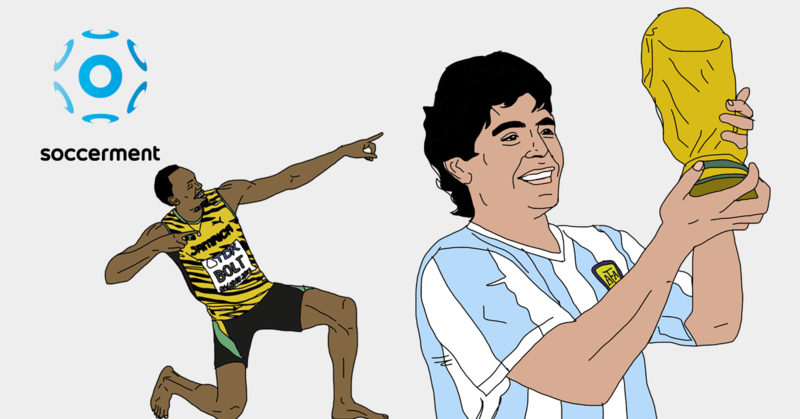 For an example of his heading skills, have a look at that goal against Juventus (gif above). Owing to Belotti’s young age (23) and his recent progression (Table 2), we consider him as one of the main contenders for the Capocannoniere title this season, although, obviously, if he remained in Serie A. At this stage, that remains quite uncertain, due to the high interest he is receiving from other leagues. Nikola Kalinić seems very close to join AC Milan, a club which is supposed to fight for an UCL place this year. This would clearly boost the scoring potential of Kalinić: in the past five years, the first four teams in the ISA have averaged 72 goals at the end of the season, which compares to the 63 goals scored by ACF Fiorentina last year (they finished 8th in the league). Kalinić scored about one-third of Fiorentina’s total (adjusted for the minutes played). Assuming he finally joined AC Milan and assuming AC Milan did well, following the squad’s significant reshuffle under the new ownership, he could be well positioned to move upwards in the scoring rankings. 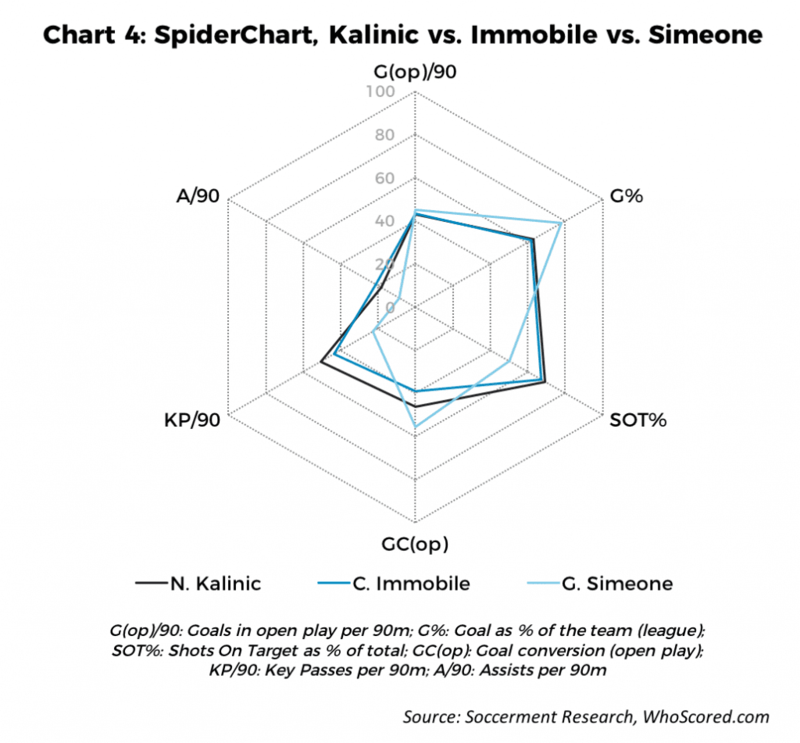 As shown in Chart 4, there are evident similarities between the SpiderCharts of Kalinić and Lazio’s Ciro Immobile, with both players focusing more on the finishing part of the job, rather than assisting their teammates. 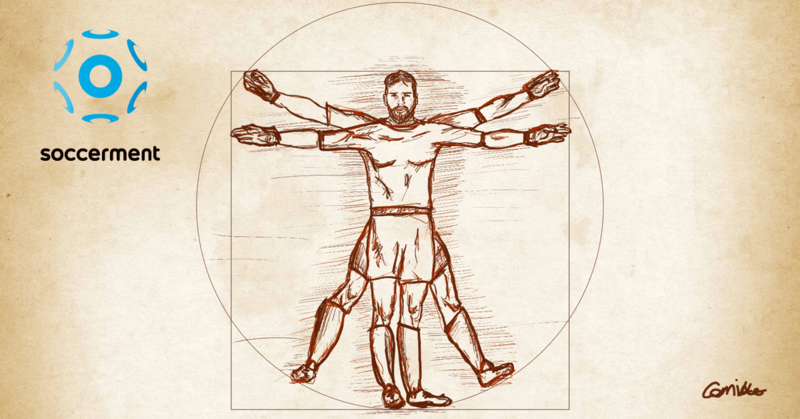 Immobile displayed a percentage of shots-on-target of 44.1%, behind Kalinić, at 45.6%. Last year, Kalinić also did better than Immobile on key-passes (1.3 per 90 min vs. 1.1), but he was slightly less effective on assists (0.07 per 90 min vs. 0.08). However, on this last datapoint, playing in a bigger club could really make a difference for Kalinić. Within the “outsiders” category we also include Giovanni Simeone, who recently joined ACF Fiorentina (likely to replace Kalinić). 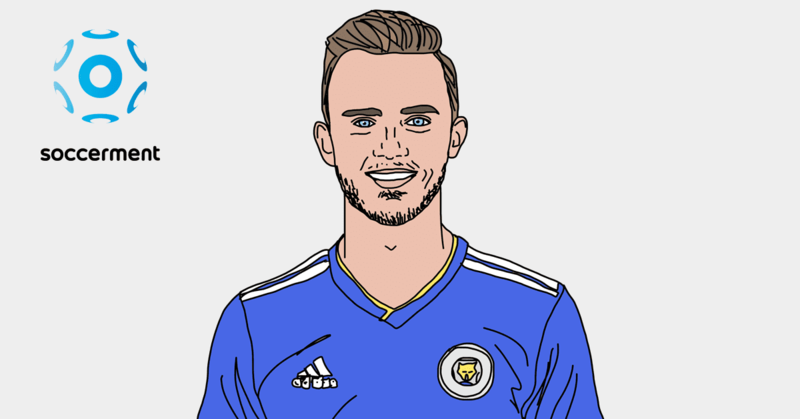 Last season the Argentinian was able to reach a decent place in the ISA top-scorers table (16th with 12 goals), despite: i) it was his first season in ISA; ii) the relatively young age (21); iii) CFC Genoa totalled just 38 goals in the league. Adjusting for the minutes he played, Simeone scored 41% of his team’s goals, the highest percentage in our panel of ISA players. 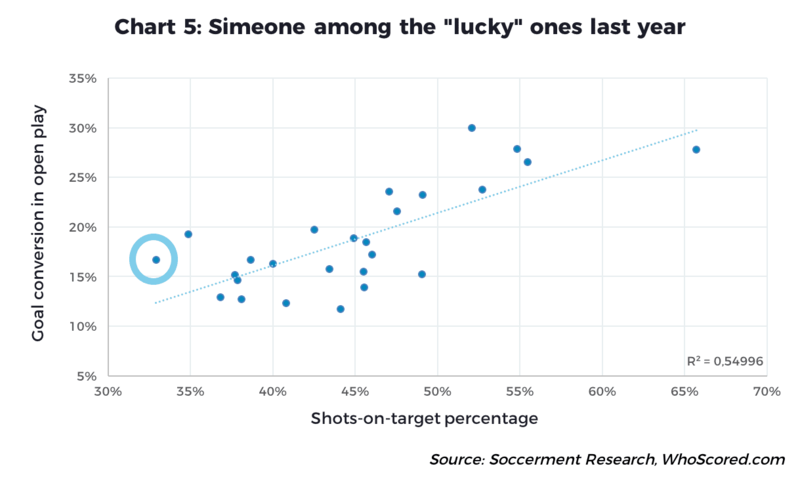 On the one hand, having joined Fiorentina could be the trigger for climbing the top-scorers table; on the other hand, Simeone’s goal conversion in open play last year (16.7%) was probably a touch too high when compared to his percentage of shots-on-target (32.9%), potentially signalling a limited repeatability. As shown in Chart 5, Simeone (circled) stood above the regression line, among the players having outperformed on goal conversion, related to their SOT%.